The earliest music on this CD are the Three Impromptus for piano, written in 1959 and dedicated to John Ogdon. They are brief pieces that do not resemble the longer, more developed examples by Schubert, Chopin and Fauré. An Impromptu is usually defined as an extended song form, giving the impression of an improvisation. McCabe’s examples are certainly not ‘extended’: the first lasts a mere 46 seconds. What he has done, is to take one pianistic figuration or idea and given it a brief exposition before closing it down, suddenly. Tamami Honma (ed. Odam, George, Landscapes of the Mind: The Music of John McCabe, London 2009) has suggested they are more akin to Chopin’s shorter Preludes than anything else. The first is a vibrant little toccata in triplets, which suggests hunting and halloo, the second is a melancholy ‘Sicilienne’ and the final impromptu is a ‘dramatic fragment’, a ‘Vision Fugitive.’ I understand that there are two further Impromptus in this set, which remain in manuscript. I wonder if Jane Page will record these too? I first came across John McCabe’s Afternoons and Afterwards for piano when it was published around 1982. It was a collection of seven short, well-crafted, pieces designed to ‘fill the gap between starting to learn the piano and playing ‘real’ music.’ In other words, they are around Grades 5 and 6 of the Associated Board Examinations. Now, I am not happy with the use of the word ‘real’ music. I have played many pieces of piano music in the lower Grades (1-5) which include Bach, Haydn and Beethoven. Whilst many of these ‘grade pieces’ are at a lower technical level, they are still little masterpieces: they are most definitely ‘real’ music. Each of the seven pieces in Afternoons and Afterwards has an imaginative title, but somehow the liner notes and the CD cover do not list them: perhaps they assume everyone knows them! First up, is the ruminative ‘Swans at Stratford’, with its drifting, dreamy, slightly dissonant chords. This is followed by the languorous meditation ‘On the Beach’. I have never really associated John McCabe with ‘Champagne and Waltzes’, (he did enjoy malt whisky) but the third piece is just that: a ‘Champagne Waltz.’ This is a sad little dance, with not much sparkle and cork-popping, but it is quite delicious. Maybe the lover has gone away and the other partner is left sipping the ‘giggle water’? The fourth piece is ‘Sports Car’. This was inspired by a friend who owned just such a vehicle: lots of fast movement, pressing forward, with a little hold up towards the end. I have never heard of a ‘Game of Darts’ being represented musically before, but McCabe achieves this feat in the fifth piece. One can almost sense the pulling back of the hand and the slight thrust forward with the dart hitting the wire. ‘Forlane’ is on more traditional lines. This is a lovely piece which is taken a little slower than I would have imagined. Famous examples include the fourth of Gerald Finzi’s Five Bagatelles for clarinet and piano, and the fourth movement of J.S. Bach’s Orchestral Suite in C major. The last number in Afternoons and Afterwards is ‘The Artful Dodger’. Everyone knows Jack Dawkins, the wonderful character from Charles Dickens’s Oliver Twist. The music portrays his skill and cunning in petty theft and is very much an exercise in ‘Jack the Lad’. On the other hand, John McCabe may have had the East End (of London) pub of the same name in mind. All these ‘grade’ pieces are played with enthusiasm and a complete lack of condescension by Jane Ford. The ‘Lamentation Rag’ (1982) was commissioned by the BBC to mark the 250th anniversary of the birth of Haydn. John McCabe was one of six composers who were invited to write a combined ‘Homage to Haydn.' The other five (not mentioned in the liner notes) were Lennox Berkeley, George Benjamin, Richard Rodney Bennett, Robert Sherlaw Johnson and Edmund Rubbra. The composer provided a note in the manuscript (the work has never been published) that states: ‘The melodic line of this short piece is entirely derived from the musical transliteration of the name FRANZ JOSEPH HAYDN.’ Apparently, the title was chosen for two reasons: ‘it seems to suit the nature of the piece’ and it refers to one of the composer’s favourite early Haydn Symphony. (No.26 in D minor). It is a lugubrious piece that is softly ragtime, but never really becomes pastiche. One of the most remarkable series of piano works produced by any 20th British composer is John McCabe’s series of thirteen Studies. The first, a ‘Capriccio’, was composed in 1969 and the last, the ‘Berceuse’ in 2011. The composer himself recorded nos. 3, 4 and 6 on an old British Music Society disc, BMS424CD which was subsequently reissued on Naxos 8.571367. As the present CD is Volume 1 of a projected ‘complete works’ cycle, I assume that Jane Ford will record all these pieces. The earliest Study presented on this disc is the Paraphrase on ‘Mary, Queen of Scots’ (Study No.5). McCabe has balanced two distinct musical traditions here. Firstly, he has writtten a Prelude and a Fugue and secondly, by means of this ‘academic’ form he has devised a ‘traditional’ operatic paraphrase in the style of Liszt or Thalberg. Almost a contradiction in terms: but it is a huge success. The themes are derived from McCabe’s ballet Mary, Queen of Scots, which was written in 1975 for the Scottish Ballet. The Prelude portrays the personal side of the Queen: it is quiet and introverted and quite beautiful, if occasionally a wee bit disturbing. The Fugue is about her public face: the themes represent the ‘political battle of wills and clash of personalities’ between Mary and Queen Elizabeth I. It was commissioned by the Kelso Music Society in 1979 and was first performed by the composer at a society meeting in Kelso on 11 January 1980. Snowfall in Winter (Hommage à Debussy) (Study No.9) was composed after a visit to Lithuania. Tamami Honma (op.cit.) explains that the inspiration for the music came from a local version of baked Alaska presented to a group of musicians and the Japanese attaché at a Russian restaurant in Vilnius. The pudding was called ‘Snowfall in Winter.’ The ‘hommage’ comes to the fore in its allusion to Debussy’s magical ‘Des pas sur la niege’ (Footsteps in the Snow) from Book 1 of the Préludes. McCabe’s brittle and icy score certainly takes its cue from the Frenchman, but he moulds the material in his own imaginative manner. I used to think that Tunstall Chimes (Hommage à Ravel) (Study No.10), referred to Christ Church in the Potteries town of Tunstall. This is probably because of a family connection with that part of the world: I was wrong. The piece was inspired by the bells of Tunstall Church, near Sittingbourne in Kent, close to where the composer lived in his latter years. There is a connection to the Ravel work, with a quotation of some chords at the beginning of the first ‘fast’ section. The composer describes his music as a ‘toccata’ although there are slow sections in the middle of the work. It certainly achieves its aim: if you heard some of this work ‘blind’ one may start to wonder if it was a lost, late work by Ravel. This Study was commissioned by the British Music Society as a test piece for its Piano Awards Competition. This was held at Trinity College of Music, London on 31st October 2004 where the winner was Dominic John. In 2006 McCabe wrote his Epithalamium (Homage to Mussorgsky) (Study No.11). The score of this work is inscribed: ‘Commissioned by John Sell: Dedicated to his wife Jane Wade and to Malcolm Binns.’ The work is a juxtaposition of the intimate songs sung before the bridal chamber by Greek lads and lassies, and the crashing chords found at the at the start of the ‘Coronation Scene’ in Modest Mussorgsky’s opera Boris Godunov. The connecting theme is the bell-like music that permeates the study: wedding bells and coronation bells. The formal construction is that of a set of variations. There is feeling of impressionism about this music, that makes its piano figurations seem almost timeless (at least, over the past 125 years). It is an engaging piece that is characterised by great beauty and striking pianism. The final piece on this CD is also the last of John McCabe’s Studies. Berceuse (Study No.13) was commissioned by the Birmingham Chamber Music Society for their Diamond Jubilee Season 2011/12. It was premiered in the Adrian Boult Hall, at the Birmingham Conservatoire on 18 February by the composer. McCabe has written that two concepts are combined in this work. Firstly, the romantic idea of a Berceuse as a kind of lullaby, although he assures us that this work is not designed to rock the cradle. Secondly, McCabe has created two themes of almost equal temperament (deliberately lacking contrast) and has alternated them, before uniting them in the final bars. The tune is often played by the left hand with a right-hand accompaniment. The sound world is haunting and remains with the listener long after the last notes have died away. The work was dedicated to John and Mary Joubert. The liner notes for this CD are a bit unusual. There is no acknowledgement of who wrote/assembled them. They include cuttings from the composer’s own programme notes (e.g. use of the first-person singular) and extracts from the above-mentioned essay by Tamami Honma in Landscapes of the Mind: The Music of John McCabe. Honma is only cited as the source for an adaptation of a programme note for the Three Impromptus. 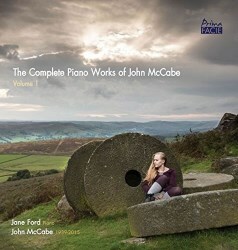 Clearly, there is little written about John McCabe’s piano music: I had to rely heavily on Honma’s essay, reviews in the musical press, the liner notes and McCabe’s website for preparing my review. There is also a brief note on the composer, and a memoir of McCabe by the composer Giles Easterbrook. Please note that I have cited the exact titles as published on John McCabe’s website not as written in the sleeve notes. Finally, I understand that many of the works on this CD are receiving their premiere recording: this fact should have been mentioned. I enjoyed this CD, which will hopefully be followed up (soon) by subsequent volumes to complete the ‘complete’ works. The playing by Jane Ford is imaginative, inspiring and sympathetic: she is a perfect advocate for John McCabe kaleidoscopic music.